Cameron’s Seafood Restaurant – How to Eat Crabs. No innuendo, no PETA. Update 5/2012: Cameron’s Seafood Closed for a while and reopened a few months later. New ownership? Before I moved to Virginia, I didn’t really know what to do with a whole steamed crab. Now I know. Cameron’s Seafood on Broad is a cool place. They have an informal seating area, but really, I think of Cameron’s as a takeout place. They usually advertise the price of crabs by the dozen on the old-fashioned lighted sign outside. You can sometimes get live crabs. They also sell them pre-steamed. I like to steam them myself and live crabs can be hard to find in Richmond. (omit ironic innuendo here). 1. Boil water in a big pot. 3. Cover the colander with a big pot lid. 4. Line your table with newspaper. 5. In about 30 minutes, the crabs will turn bright orange. Wait until they are orange! Then dump them onto the table cave-man style. 6. 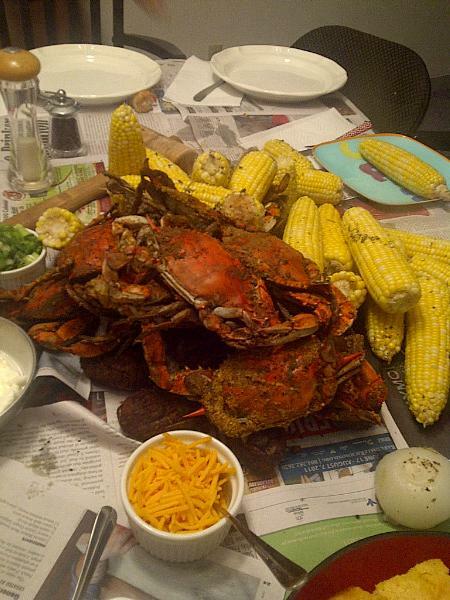 Serve the crabs with corn on the cob, baked or boiled potatoes, melted butter and good things. Make an impressive food mountain on your table. 7. Don’t forget to provide some utensils and show people how to open the crabs. I have some cool wooden mallets for claws, but have used ordinary hammers too. Rustic is fun.